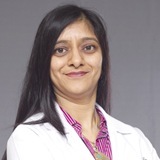 Dr. Maya jayaswal, Gynecologist, Obstetrician and Gyneac Endoscopic Surgeon, NMC Sharjah. Dr. Maya has done her MBBS and Post-Graduation in Gynecology from Government Medical College, Nagpur in year 1995 and 1998 respectively. She has achieved her Diploma in Advanced Gynecological Endoscopy from Kiel and Giessen University at Germany in 2006. She has undergone her specialization in Gynecological Laparoscopy and Hysteroscopy at Fogsi Recognised Endoscopy Centres at India with the experts and pioneers in Endoscopy in Gynecology at Jaslok Hospital, Reliance Hospital, Bhatia Hospital and Sanjeevani Endoscopy Centre at Mumbai in India. She was also attached as visiting active member in Endoscopy team at monthly workshops at Malhotra Endoscopy and IVC Centre, India since 2003 up to 2008. She has done variety of operative work as Gynaec consultant at reputed Hospitals of Mumbai and Endoscopy work at Agra. She has extensive experience of all variety of Gynecological Endoscopy patients, high risk obstetrics and infertility patients. She is life member of Federation of Obstetric and Gynecological Societies of India and Mogs. She is also actively attending and participating in National and International Conferences. She has many paper presentations and poster presentations at varied places. She is regularly been invited as the speaker in conferences and school/education institutes. She has keen interest in the field of Infertility, Fetal Medicine and Ultrasonography. She is actively participating in Cervical Cancer Detection Programs. She is doing Colposcopy for patients of abnormal pap smears and positive high risk human papilloma virus patients. She has special interest in Infertility Patients and has several successful Intrauterine Pregnancies (IUI). She also has interest in Cosmetic Gynecology for perineal region / vaginal repair. All the outpatient procedures like Colposcopy with Biopsy and Cauterization of Cervix, high risk Obstetrics care and other Gynecological procedures like Intrauterine insemination (IUI), Hysterosalphingo contrast Sonography (Hycosy) for checking tubal patency and other procedures like Mirena / Copper T Insertion / Removal, Implant removal and others comes under her Specialty. She is well versed with English, Hindi, and Marathi languages and can manage basic Arabic for medical words. She has passed her tenth standard with extinction with 96 % in PCB group and was gold medalist in Maths. Her Academic Carrier was Excellent.